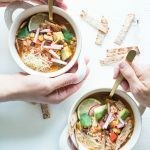 This Instant Pot Chicken Tortilla Soup is the FIRST recipe I ever made in my pressure cooker, and I’ve been head over heels for this workhorse appliance ever since. I’ve gotta admit…at first, I was intimidated by it. The Instant Pot has way more functions (and buttons) than my slow cooker and came with a thick manual <– all things that tend to send me running for the hills. But once I got the hang of it, I realized how simple and life-changing electric pressure cookers can be. They cut down the cook time considerably on dishes like these, without sacrificing the flavor one bit. And I love that it yields consistently tender, moist, and flavorful meat every.single.time. We have been making this Chicken Tortilla Soup recipe a TON lately. You can’t go wrong with hot soup and lots of warming spices, especially when it tastes like takeout but feels infinitely better. This Mexican-inspired dish is one of my weekly meal-prep go-to’s that I’ve been dreaming of sharing with you for months. Economical pantry staple ingredients come together with easy-to-find fresh ingredients to create a soup with a delicious depth of flavor, subtle spiciness, and hearty texture. The chicken broth, caramelized onions, fresh garlic, diced tomatoes, chipotle powder, mild green chiles, and tomato paste make for an addicting broth. The rich flavor really anchors the healthy (but otherwise super plain-tasting) ingredients like bell peppers, black beans, and lean chicken breast. We love that this recipe makes enough food to feed us all week long. Having a heat-n-eat dish on hand in the fridge feels like a godsend when it’s the middle of the week and you really don’t feel like cooking anything when dinner time rolls around. And these leftovers hardly feel “left over” when you dress up your bowl with fresh toppings. My non-negotiable // must-have toppings are crispy tortilla strips + a dollop of Greek yogurt + a dash of Cholula. And if I’m feeling fancy, some fresh avocado and cilantro on top too. A little bit of crunch, a little bit of creaminess to cut through the acid of the tomato and the mild-heat of the broth – the toppings really take it all to the next level. 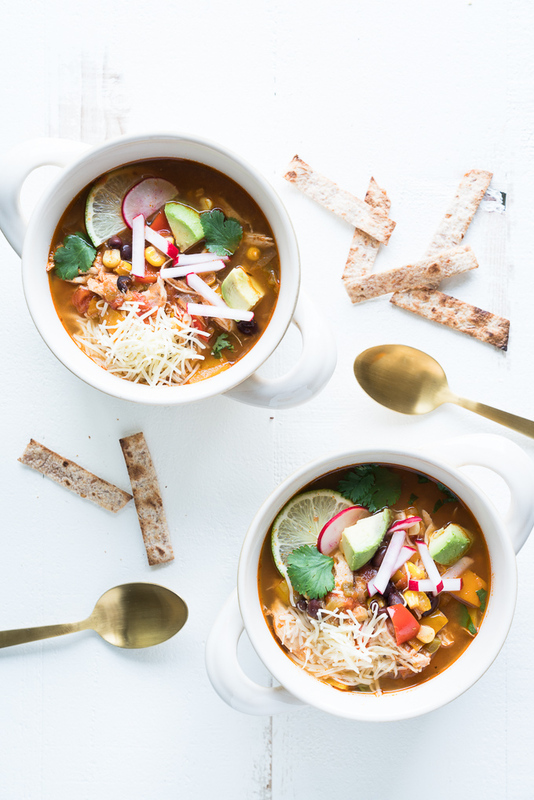 And that dash of Cholula is a game changer – there’s something about adding a fresh zip of vinegar-y tangy flavor to a hot soup that brings it all together for me. 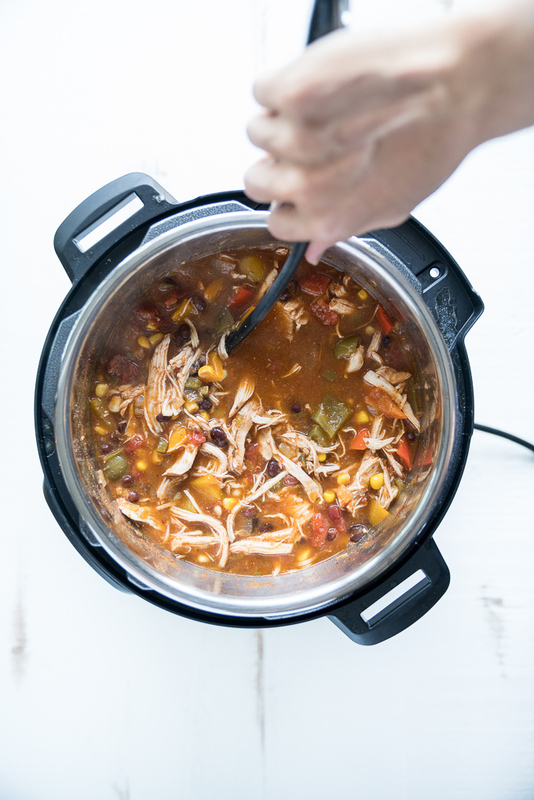 You could make this Chicken Tortilla Soup recipe in the slow cooker but I like to make mine in the Instant Pot because it has a sauté function AND a pressure cook function built into one appliance. Whereas with the slow cooker, I would have to dirty a separate pan to sauté the onion and soften it before adding it in to the crockpot – dirtying a second dish. 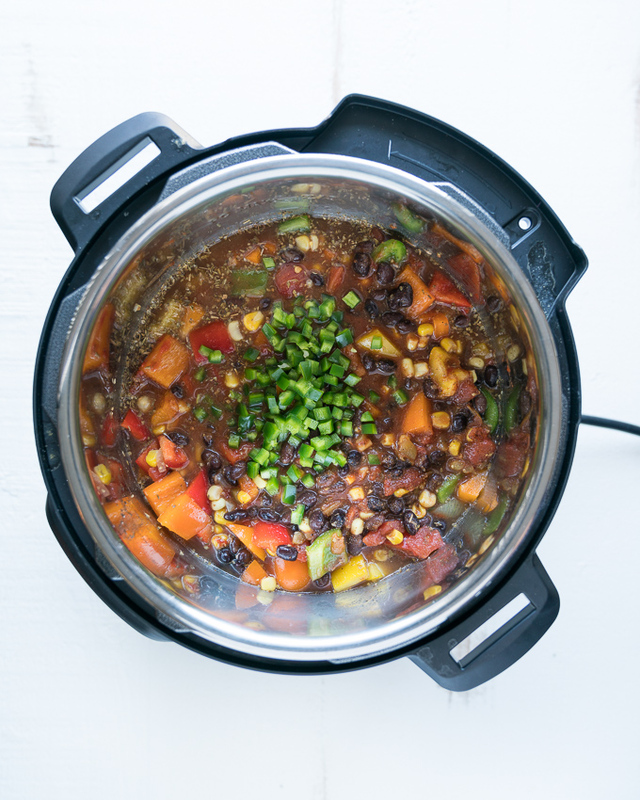 This electronic pressure cooker simplifies things down to one single appliance. And the fact that I can cut down the cook time from 3-4 hours down to 1 hour, is pretty sweet too. This recipe is really customizable – so whether you’re trying to eat more veggies or more protein, or if you like things spicy or not-so-spicy there’s plenty of options (detailed below) for you to make this into something that uniquely suits how you like to eat! In our house we like to have really hearty soups with lots of protein, simply because we’ve noticed that when we eat that way we (1) have more energy and (2) we feel fuller + more satisfied after a meal. We usually add in about 4 chicken breasts. But if you don’t like to eat a lot of protein and want a more vegetable-heavy soup, then you can cut it down to 1-2 chicken breasts and add in the same volume of beans / veggies to replace it. The important thing is to just be careful to not overfill the pot. 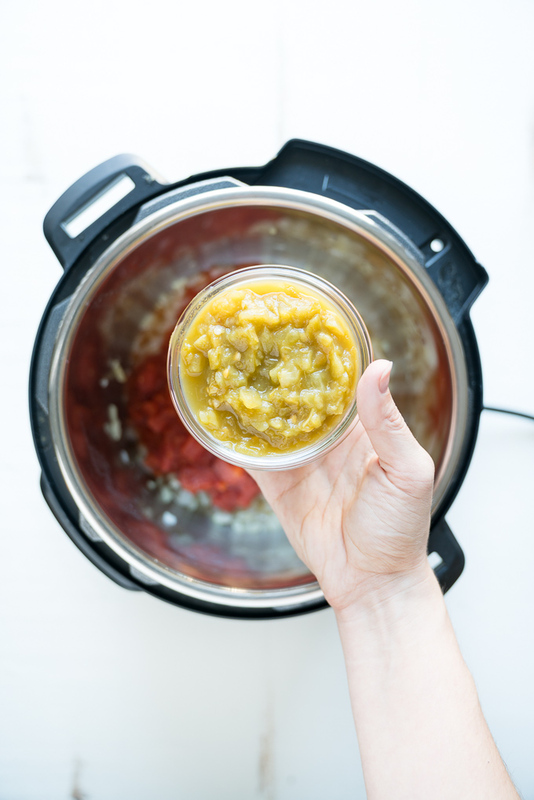 That fill line you see marked on your pressure cooker is the maximum amount of liquid and solids that you should be putting into your instant pot. This is why I add the chicken breasts last on the recipe instructions before setting it to cook. Since chicken breasts can often vary in size and weight, there isn’t a standard amount that you will be able to fit in every time. So I prioritize the veggies I want to cook and then add one piece of chicken at a time to see how many will comfortably fit into the pot. If you want to add more protein later, you can always cook a separate batch of chicken to “beef” up the meat ratio afterwards. The Mexican-inspired flavors are so assertive in this tomato-chile broth dish that the plain chicken won’t noticeably affect the flavor balance. If you aren’t crazy about bell peppers or just want to introduce some more vegetable variety in, we’ve had awesome results by adding in things like chopped up cauliflower florets or even sliced zucchini to bulk things up with additional vegetable fiber. Frozen peas, or sautéed celery and carrots work well here too. Wilted mild greens like spinach or micro greens / sprouts would also be great additions. This recipe will work well with any mild vegetables you’d like to add into this dish. I just wouldn’t suggest adding in anything with a stronger flavor like broccoli, mushrooms, bok choy, or other bitter greens that could infuse into the broth and affect the taste of the whole dish. I know sometimes people who don’t love spicy food see a jalapeño pepper in the ingredient list and will be keen to “X” out of this tab on their browser. Nope. Too Spicy. Not.For.Me. But believe me when I tell you that I’ve made this before without one included at ALL and it was still delicious. I’m from San Diego, and I consider my spice tolerance levels to be pretty normal. I love hot sauce, and won’t eat my morning eggs without it, but I’m no dare devil. If it has the words “Habañero” or “Ghost Pepper” in it – I’m OUT. But I’ve found jalapeños to be a good middle ground for spicy-food enthusiasts. If you DO like a little heat – you can adjust the amount of the heat coming from the jalapeño peppers to suit your spice tolerance. The heat of a jalapeño is most concentrated in its seeds and the white ribs (that hold the seeds) on the inside of the pepper. The more seeds and ribs you include in a dish, the spicier it will be. Removing these doesn’t entirely get rid of the spice but it tones it down considerably so it’s more of a pleasant flavor than an overwhelming / dominating heat level. I like to add one whole pepper in that has been seeded with the ribs removed, for a more subtle heat. But if you like things MORE spicy, you can keep the ribs and seeds (or adjust down to only half with seeds / half without seeds). To easily remove these, I slice the jalapeño lengthwise and then use a spoon (preferably one with a pointed end) to scrape out the seeds and ribs. Just watch your eyes when you do this so that the juice doesn’t get into your eyes, and be sure to wash your hands really well after working with them. The oils that get released can stay on your fingertips and hurt like hell if you accidentally rub them on your eyes. Another easy way to avoid this is to use plastic gloves when handling spicy peppers (or stick the hand you’re using to hold the pepper inside of a plastic sandwich bag to prevent your skin coming into contact with the pepper). Another source of the heat in this dish comes from the Chipotle powder – consider halving the amount in the recipe card too if you find it’s too spicy for your liking. Or you can swap to chili powder instead (but the taste will be different, more like an earthy chili than a tomato-chile broth). And remember, after cooking you can always take the heat levels down a notch by adding sour cream / a dollop of Greek yogurt. Or by thinning out the broth with more chicken broth. 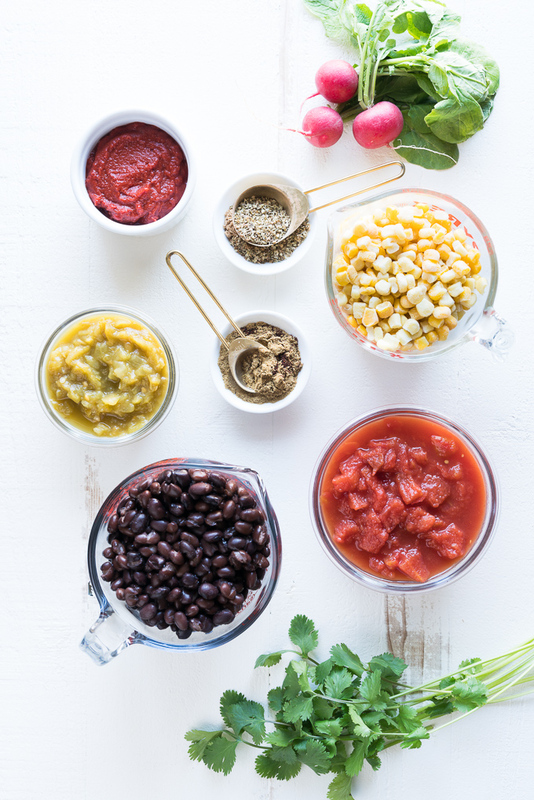 Toppings will help disperse the heat a lot as well – especially ones like avocado (creamy, healthy fats) and crisped tortilla strips (the starchy, dry carbohydrates will soak up some of the broth as you eat it). Conversely, if it’s not spicy enough you can also kick it up a notch by adding a dash of Cholula hot sauce just before serving. When it comes to your food – know thyself. Especially when it comes to spicy food and spicy ingredients. Don’t ever feel pressured to add something into a recipe just because someone else says it is delicious. Trust your instincts and honor your personal taste. I promise I won’t be offended if you omit the jalapeño. It will still taste delicious and your tastebuds will be happier for it too! 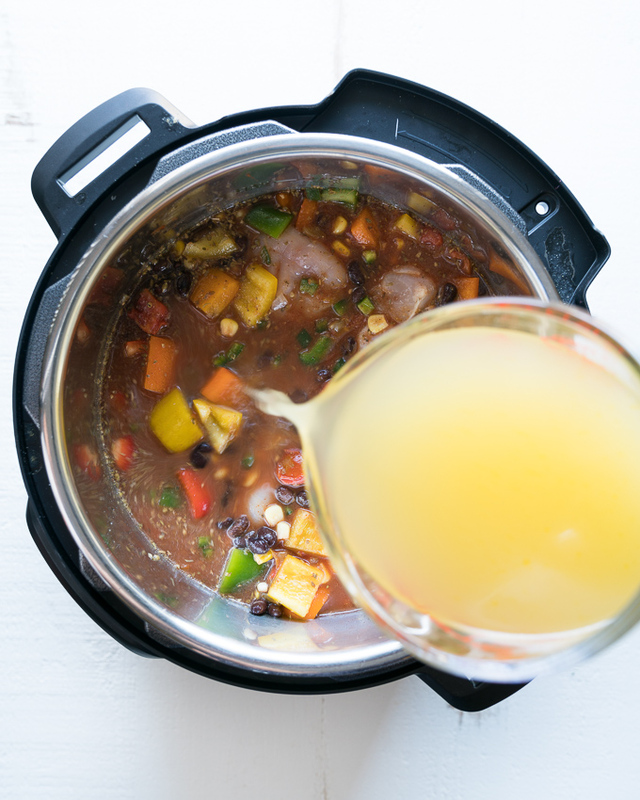 I opt for a 10-15 minute natural release (turning the pressure cooker off and allowing the pressure to naturally release) before I flip the venting knob to release the remaining pressure in the pot. 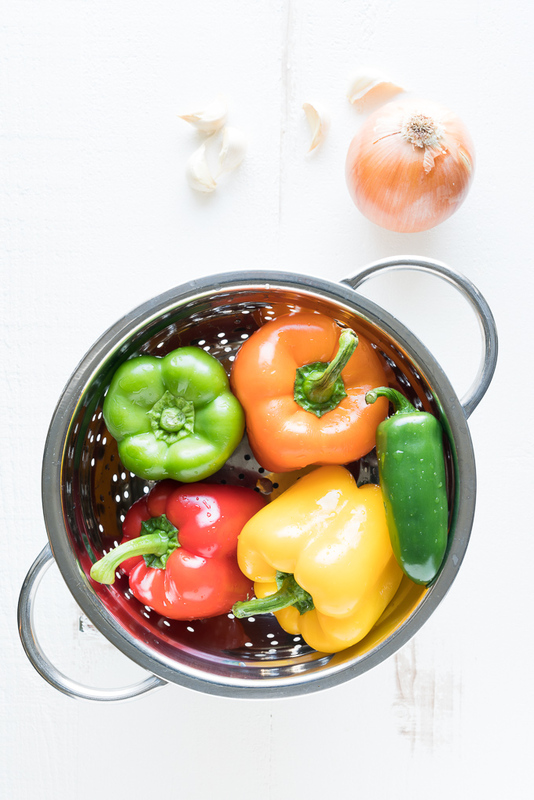 Even though a quick release is preferred when you’re working with delicate vegetables, a natural release is recommended for soups and stews because it lets the cooking process stop slowly – giving the soup more time for flavors to infuse (kind of like a slow cooker or a slowly-simmered stove top prepared soup might). Since this is a soup, I don’t mind if the vegetables get a little softer with this additional simmering time. Especially if I’m adding in corn at the end (which adds a fresher texture) and if I’m topping it with lots of fresh crunchy toppings (like tortilla chips, radishes, etc). I think the textures all play together really well and everything evens out in the end! 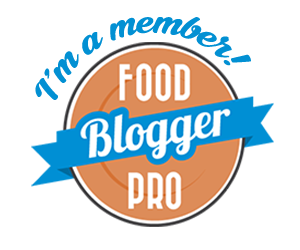 So tell me, friends – are you more of a slow cooker fan or are pressure cookers your go-to for weekly homemade meals? 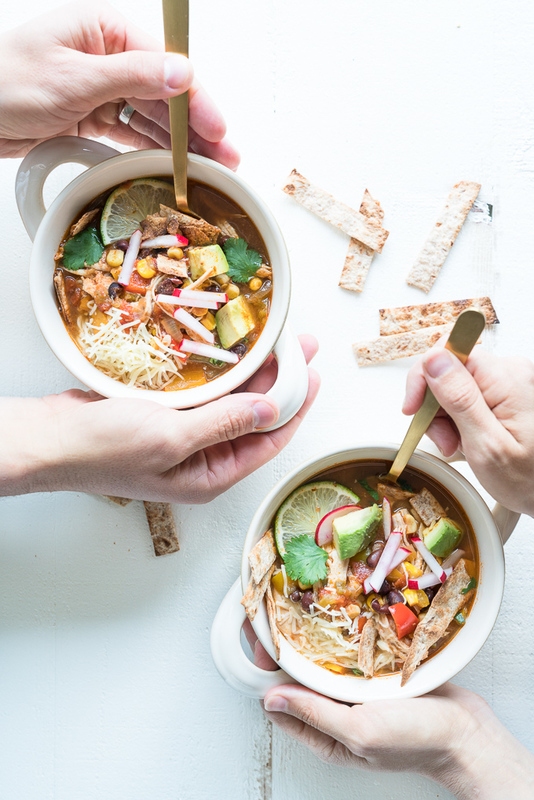 Healthy recipe for Instant Pot Chicken Tortilla soup! Using lean chicken breast, black beans, tomatoes, bell peppers, green chiles, jalapeño, corn, and more. Best served with fresh toppings – like sour cream + avocado + crisped tortilla strips! 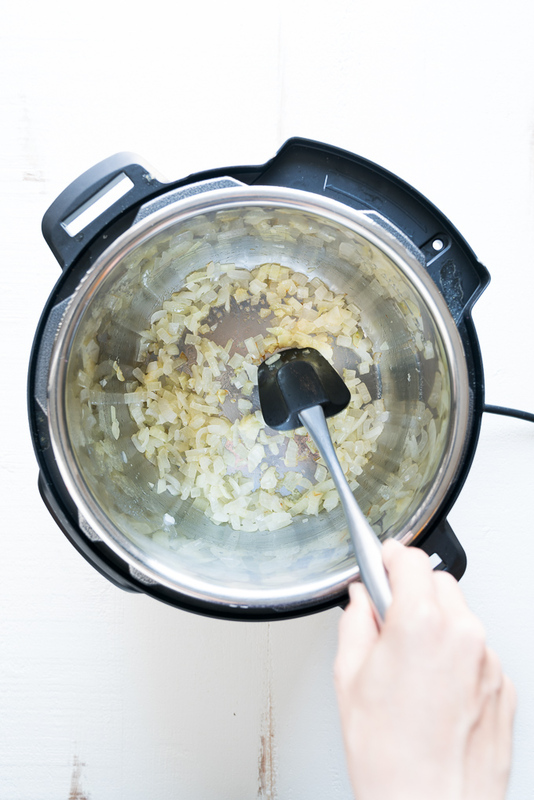 SAUTÉ ONION: Turn your instant pot onto the sauté function, and sauté the onion in avocado oil until it has begun to soften. Then hit the “Cancel” button to turn it off. Move quickly to next step to avoid burning the onions. FILL UP POT: Add all remaining ingredients to the pot (except the chicken breasts and the frozen corn, if using) and stir until well combined. Add in the chicken breasts, one at a time, being careful not to go over the 2/3 fill line marking on the side of the pot. Only add in as much as will fit under that line. If using the corn, you may only be able to fit 2 large chicken breasts or 3 small. If you really want to do both the corn AND 4 chicken breasts, just leave the corn out for now – let the corn thaw while the soup cooks and add it at the very end. The heat from the soup will thaw it completely, but it’s very important to not overfill the pot during the pressure cooking process. TURN ON TO PRESSURE COOK: Secure the lid into place and make sure the steam release handle is in the Sealing position. Press “Pressure Cook” and use the + and – buttons to set it to 5 minutes. It can take 35+ minutes to reach pressure. When you hear the notification that it has reached temperature and then the notification that it has finished its 5 min cook time, click “cancel” to turn it off (or unplug it completely). Natural release (leave the pot alone) for 10-15 minutes before quick releasing the remaining pressure. CUT + SHRED THE CHICKEN: When the pressure has fully released, remove the lid and take the chicken breasts out of the pot. Move them to a cutting board and run your knife once lengthwise down the chicken breast. Then, using two forks, shred it into large chunks and return chicken to the pot. Stir until well combined. ADD TOPPINGS + SERVE: Serve with your choice of toppings – our favorite are toaster-oven crisped tortilla strips, a dollop of Greek yogurt, and a dash of Cholula hot sauce. Store in lidded containers in the fridge for up to 5 days. 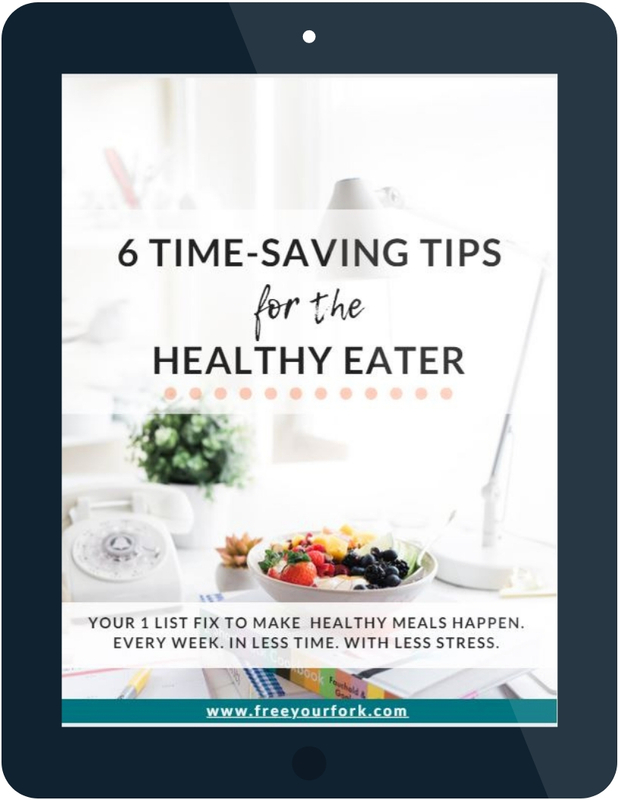 *depending on size and how many chicken breasts you are using, I can usually fit four chicken breasts and three medium sized bell peppers before hitting the max fill line. And if I want to use the frozen corn in addition to the full amount of chicken and other vegetables, I will add it in at the very end after the rest has cooked. HOW TO MAKE CRISPY TORTILLA STRIPS: I cut mine with a knife or a pair of scissors into 1″ wide strips that are about 2-3″ long, then I lay them out directly onto the rack in a toaster oven and toast them until golden and crisped. Stay close by while you toast these, since they are so small they can go from toasted to burnt very quickly (especially the smaller pieces). 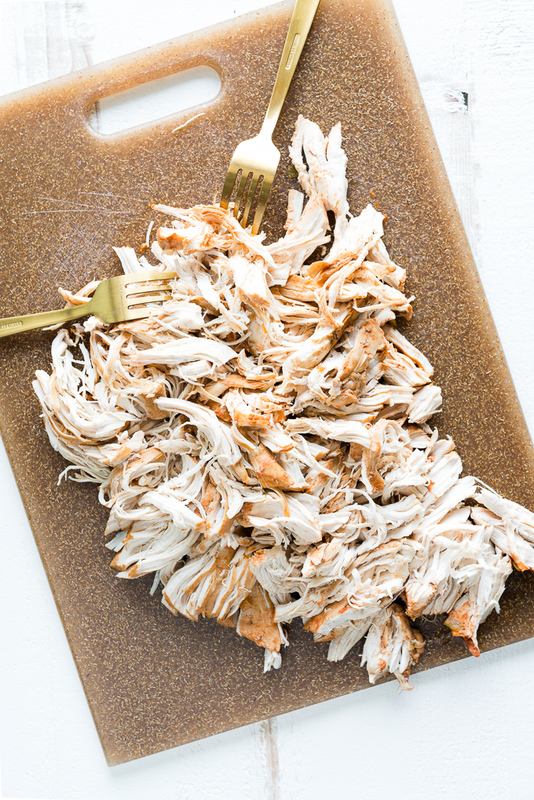 CHOPPED VS. SHREDDED CHICKEN: I have just shredded it before but the pieces are often the entire width of the chicken breast. Meaning they don’t sit nicely or fit onto a spoon-sized bite. If you chop them into pieces (which if you like a chunkier, meatier soup texture you could) and then shred them, the chicken shreds will fit easily onto your spoon. Making for less messy, and (more importantly) quicker eating. LEFTOVERS TIP: The chicken tends to absorb the broth throughout the week, while this doesn’t affect the texture of the chicken (quite the opposite, it actually helps keep the chicken moist and tender) it can affect the broth to chunky ingredients ratio towards the end of the week. So to combat this, if I notice towards the end of the week that the broth amount has started thinning I will add a splash of chicken broth to add volume back to the soup. A little pinch of salt and dash of Cholula (or if you don’t like spice then a squeeze of lime or lemon) will restore any flavor imbalances from the added liquid. This sounds like JUST the tortilla soup recipe I’ve been looking for! We have a week of rain in the forecast in California so I’m stocking up on soup recipes. Bookmarking for this week. Hope this soups warms up your rainy week! It’s making for some gorgeous clouds in CA though and it gives me an excuse to keep eating this soup on repeat though, so it’s hard to complain right? Let me know how you like it, Erika!